Ah, the golden age of steam. This phrase brings to mind the glorious engines that once choo-chooed across Britain. A time when the railway network was king, trains stuck rigidly to a timetable and arriving even a couple of minutes late was a no-no. Dr Beeching would be spinning in his ticket booth if he saw the state of rail travel today. Cancellations, signal failures galore, leaves on the line and sunlight in the eyes, all bringing the entire operation to a standstill…and that’s on a good day. 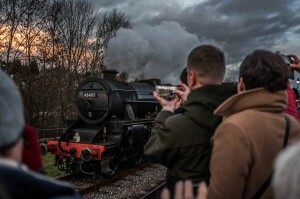 It’s no wonder romantics hark back to the era of the steam train, and even less of a surprise that the return of The Flying Scotsman last weekend had so many well-wishers and admirers lining up on the platform in Bury, Lancashire and along the route of the East Lancashire Railway. The 92-year-old engine drew huge crowds on its initial weekend of test runs, the first time it’s been on the rails for a decade. The genuine excitement of the kids was more than eclipsed by the ‘big’ kids who had their cameras, binoculars and biggest smiles ever present. At Bury we were told there was a delay and our 11.30am train was running about 20 minutes late. But this didn’t dampen our spirits which were boosted by the personal and fun tannoy announcements that boomed out while we waited on the platform. When this Scot boarded the locomotive, it was like stepping into an Ealing comedy. I had to manoeuvre along a narrow corridor to reach my allocated area. Not easy if you’re the one who ate all the pies. I was in my own six seater compartment, the old fashioned kind with a sliding door and a rail above for luggage. As soon as I sat down my imagination let loose. One minute I was a bowler-hatted Reggie Perrin on my daily commute to the city, newspaper folded beneath my arm and a briefcase full of sandwiches. Then I was a detective caught up in a murder mystery (although it’s possible The Lady Vanishes may lose some of its dramatic edge if relocated to Bury). When we finally pulled out of Bury station and headed towards Rawtenstall, I settled into the role of royalty. Hundreds of onlookers lined the route, taking pictures and waving enthusiastically as we chugged past at a perky 25mph. Well what else could I do but wave back? It would have been impolite not to. OK, so the train was freezing and the journey took an awfully long time to complete its round trip, but that really wasn’t the point. We were sitting aboard a piece of history and you don’t get the chance to do that every day. 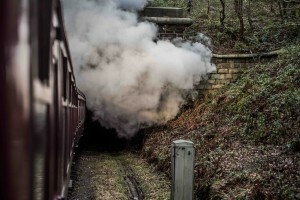 When I eventually disembarked, I experienced a Jenny Agutter Railway Children moment. 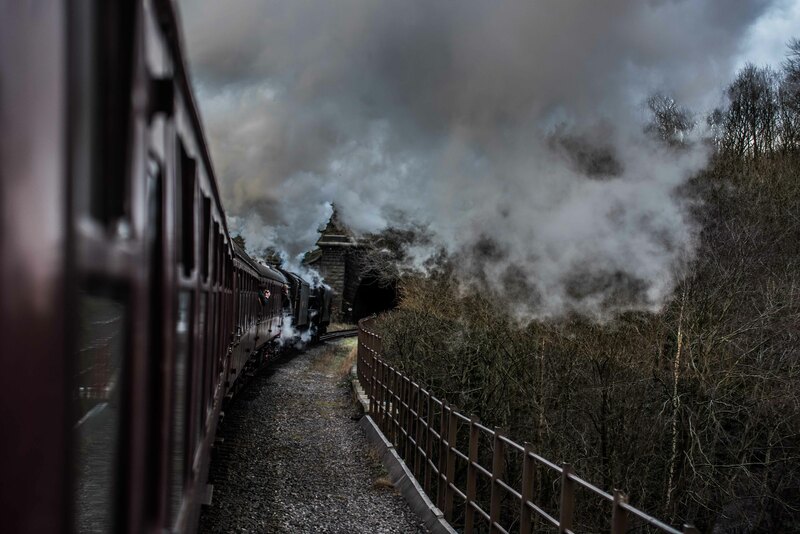 I stepped onto the platform surrounded by steam. Just for a moment I pretended that someone special was going to materialise when the mists cleared. It was not to be. A wave of trainspotters shoved me out of the way, barging forward en masse for a closer look at the other Scot in town.